Note : Your request will be directed to Lotus Communication Systems. 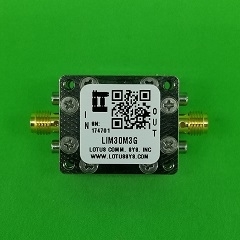 The LIM30M3G is an RF limiter that protects against ESD and input power surges over a frequency range of 30 to 3000 MHz. It limits an input power range from 12 to 30 dBm to 11.5 dBm at the output. The limiter has a low insertion loss of 0.23 dB and a recovery time of 10 nsec. It is available in a small 1-1/8 x 15/16 x 0.59 inches shielded RF enclosure and is ideal for stabilizing RF outputs, reducing amplitude variations and protecting LNA in hostile environments.